The Quechua theatrical work Ollantay (discovered in the 18th century) provides a vital opportunity to observe how the colonial Quechua peoples contextualized the importance of communication. 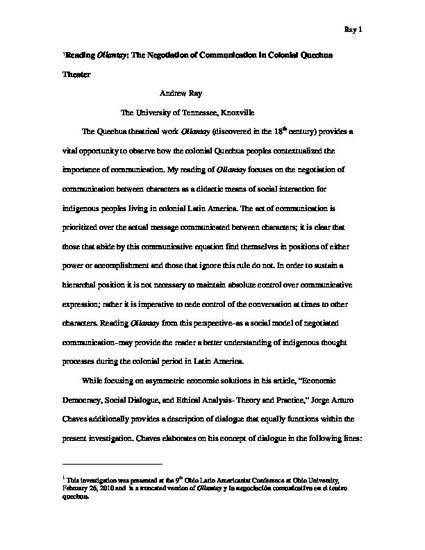 My reading of Ollantay focuses on the negotiation of communication between characters as a didactic means of social interaction for indigenous peoples living in colonial Latin America. The act of communication is prioritized over the actual message communicated between characters; it is clear that those that abide by this communicative equation find themselves in positions of either power or accomplishment and those that ignore this rule do not. In order to sustain a hierarchal position it is not necessary to maintain absolute control over communicative expression; rather it is imperative to cede control of the conversation at times to other characters. Reading Ollantay from this perspective–as a social model of negotiated communication–may provide the reader a better understanding of indigenous thought processes during the colonial period in Latin America.